Thanks for having me, G! The pictures look better posted on your blog ;-). So happy I found powdered ube [purple yam not purple sweet potatoes] ube without additional coloring! BTW, are the recipes adapted from Michel Suas's book. Tita Flips, thanks! G, thanks for fixing the link! I was not happy with the Macarons I made a few months ago. It was flat and the texture was kind of chewy at the same time hard. What could the problem be Annapet? So glad to see Annapet and her gorgeous macs here! Great collaboration girls! The coffee macs look gorgeous! I first tried macarons for the first time a few weeks ago and fell in LOVE. i really need to try this recipe...they look perfect and so cute with their little feet! 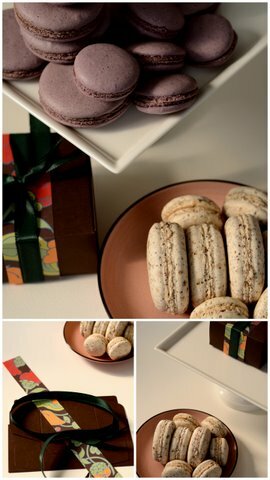 Malou-these macarons are absolutely gorgeous...can't believe why I have never tried to make them. I would be afraid that they would flop for me! So nice to have a guest post once a week to give you a day off from having to figure out what to post from your own...that's the dilemma I'm in right now! I'll be away in SF and will be thinking of all of you, too bad you couldn't make it! Annapet: I am so thrilled to have a macaron post in my blog, you don't only know how much I wanted you to guest post haha. thank you so much for the time and work that you put in into this post. Salamat ng marami! Tita: Thanks for letting me know, I have now fixed the linky. Oggi: THanks for dropping by. Annapet sure answered your question already right? I hope your macs will turn out fab! Jenny: I will ask Annapet. She will definitely know the answer better than I do haha. I will email it to ya! An: Great to see you again. I know you've been coming over to see Annapet's post and I'm glad I didn't disappoint you this time hihihi! Carol: yup and you're next. Can't wait to feature you in my blog. Maybe next month? haha just let me know when you are ready! Joanne: I have to go check out your Mac post. How come I missed it? I hope you will try these macs esp the Ube one. Elisabeth: Don't get intimidated. I'm sure you could do it, you are a seasoned chef so there's no reason why right? Happy trip and enjoy Foodbuzz! Shireen: Yay we found each other again. NO worries, I have followed you and bookmarked! So there's no reason why we should not get in touch now. haha. Have a great day! These looks so delicious I just may overcome my fear of macarons and make them! They look great & I think I may have to make some tonight. Maybe you can check out my pictutorial on French Macs. Thank you all! Feels great to be welcomed here at Skip To Malou! Claudia, there is nothing to fear! Ask away questions you may have. Perhaps try the French Meringue method, too. It skips making syrup! Thanks, Maggie Mae. Your Hello Kitty Macarons are adorable! Oh, Rebecca, with you cheering me on always, I might just! I'll keep on practicing in the meantime. Nami, I left the lab a lifetime ago! My experiments are in the kitchen and garden now! Thank you for stopping by! Thanks, Mary! Let's make macaron-making like "easy as pie" and it can be! Hi, Jenny! Could you please share which recipe you used? Thanks. When I started making macarons, I went through a few recipes myself. Over-mixed batter often results to flat macarons since the meringue has been deflated way too much. The marshmallow texture can be compared to the fluffy Brazo De Mercedes. Hi Annapet, Wow feeling I know you na! Yes for sure because Malou talks so much about you which makes me jealous LOL! 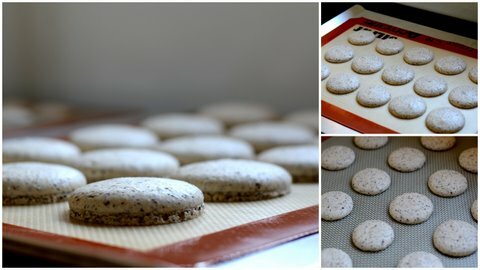 Ok I got the recipe herehttp://dhaleb.com/food-type/dessert/macarons-born-blogger/ and tried it and that's how it became. But your answer to my question make sense and yes my brazo failed too. It was flat as well and now I know now what to do. Thanks so much for answering my question. Ill follow what you said and for sure you will know the results. These macarons look gorgeous, you have done a great job, Annapet :)!! Jenny, the link took me back more links but not the recipe per se, but that's OK! Those are reputable blogs! One of my favorite macaron bloggers [and she is Macaron Queen to me] is Rachel, AKA @pleasure_monger on Twitter. i love these exquisite macarons and i love annapet! :D where did u find these powdered ube? is there a link to it online? ps - that champorado sounds so good! do u have a recipe post? cooking gallery: Annapet indeed did a great job! ANd im so grateful to share it with my readers. jean: Im so glad you found the time to comment. 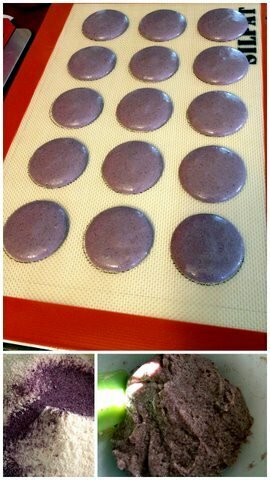 Try to make them with Lady Macaron's recipe, it will make the difference. Good luck! Junia: thanks for stopping by and for the kind words. yes i sent you the champorado post, hoping to see you try it soon too... and of course as well as these macs haha. have a great day. Alisha: Annapet did a wonderful job and it's great to have her as guest post. Thanks again Annapet. Lady Macaron: wow so honored to have you stop by. You are Annapet's "queen of macarons" haha. thank you for generously sharing your recipes and your skills with us. Annapet will be thrilled to see you stop by! Annapet: Thanks again so mucho. You are an awesome guest and I hope this won't be the last!